So what we got was prawn wrapped in a very thin and delicate wrapper, and coated with lots of sesame seeds on one side. This was very, very delicious. Yes, it was deep-fried with lots of oil, but it didn't feel particularly greasy. The golden sesame seeds, of course, were very fragrant. Pan-fried rice flour rolls with XO sauce (XO醬炒腸粉) - I would have preferred the rice flour rolls to be a little more crispy, but these were OK. They didn't skimp on the XO sauce, so the flavors were pretty strong. Steamed dumplings Fungshing-style (鳳城蒸粉果) - certainly different from the common Chiuchow-style steamed dumplings (潮州粉果), as the wrapper here was still opaque and not translucent. The absence of peanuts was conspicuous, and the fillings included prawns, ground pork, bamboo shoots, chives, carrots, and mushrooms. Milder in terms of flavors and without the hard crunch of peanuts. Deep-fried spring rolls with chicken and prawns (雞絲蝦春卷) - FAIL. Normally these are my favorite spring roll in town, but today these were simply left in the oil for too long. One can tell by just looking at the color - which shows a darker brown instead of the usual golden brown - and the amount of grease soaked up also made these less palatable. We decided not to have dessert here, and instead walked over to Lab Made Ice Cream. One of their current flavors is a "cross over" with Tai Hing (太興), and features the restaurant chain's famed milk tea. This was pretty good. I definitely recognized the thick, milky texture of the tea, and they even included a few cubes of unsweetened tea jelly. 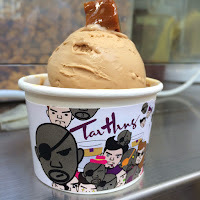 For someone like me, who regularly visits Tai Hing and drinks their milk tea, this was definitely worth checking out.